Sonia Angus: Recycling in Seattle. Recently at university we watched the video "Story of Stuff" by Annie Leonard. It was about how much stuff we buy and how much we waste and how this cycle of buying and wasting is affecting our planet. This got me thinking about how much I recycle and how we all can be encouraged to do more? I recycle the basics and by basics I mean my empty water bottles and wine bottles. To be honest I'm not even sure what's supposed to go in that little green box they gave us. I'm sure there are a lot of people like me who don't really know what to do when it comes to recycling. It's not just good enough to tell someone to recycle, I think we all need to be taught to recycle or at least be made aware of what and how to recycle. Maybe the U.K. should try encouraging people more and taking a few pointers from Seattle. 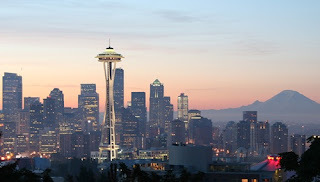 Seattle was voted the most "green" city in the U.S. by the Natural Resources Defence Council. It's the greenest city for a number of reasons; it uses hydroelectric power for about 90% of its electrical demands, it has a successful car pool system and has comprehensive recycling and sustainable resource use practices. But why does recycling in Seattle work? Well they have informative posters which make it clear what to recycle where. They are also told to, "Keep Recycling Out of Garbage." and "Keep Garbage out of Recycling." If they don't keep the garbage out of the recycling residents will get a warning and if it is excessively contaminated with garbage it won't be picked up. 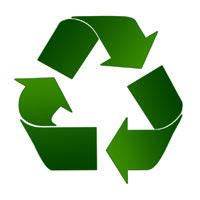 If they don't keep the recycling out of the garbage and garbage containers contain more than 10% of recyclables then it will not be emptied and they will be left instructions to remove the recyclables before the next collection. If the instructions aren't followed they will be charged! Maybe the U.K. needs a more active system like this one. I suppose it is kind of threatening people to recycle or pay up but maybe people will respond better to that than nothing at all. I guess we should be prepared because sooner or later we are all going to have to pay the price.